Hi, need help. 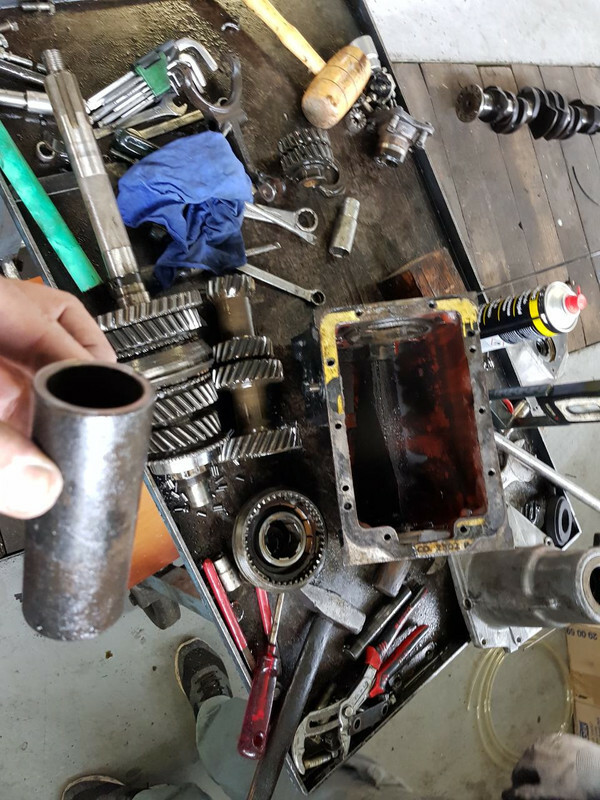 After hearing strange noise I ended up with dismantled gearbox. 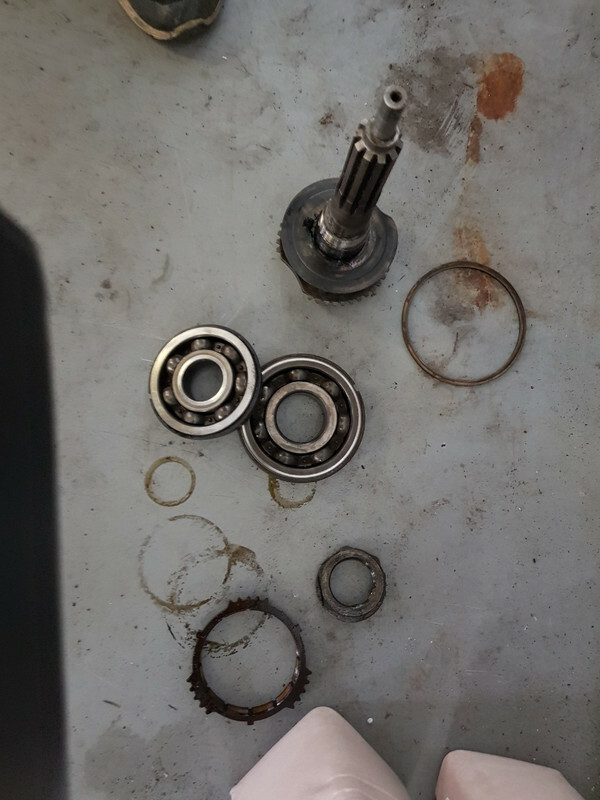 Bearings have to be replaced but also a distance tube C23336 which is not made any more. I will make new one but as this one is worn out I need exact measures for it. Thanks. After hearing strange noise I ended up with dismantled gearbox. I will make new one but as this one is worn out I need exact measures for it. The length is 4.156" (4 and 5/32 inches). If the Distance Tube is worn, the clamping force applied by the Companion Flange nut must have reduced to the point where the Oil Pump Drive, Speedo Drive Gear and Distance Tube have been slipping against each other. 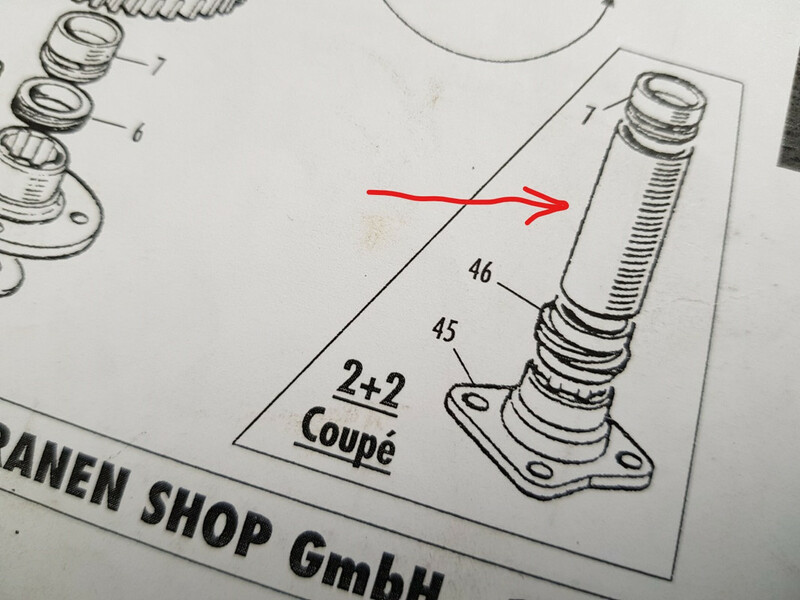 This is a common fault, as friction alone, brought about by the clamping of these components by the Companion Flange nut, is all that drives the Oil Pump Drive and Speedo Drive Gear. The following pictures are of the two sides of the correct, original rear bearing. You will note that one side has practically no radius between the face and bore of the inner race. This side of the bearing faces towards the rear and is the face that the Oil Pump Drive makes contact with. 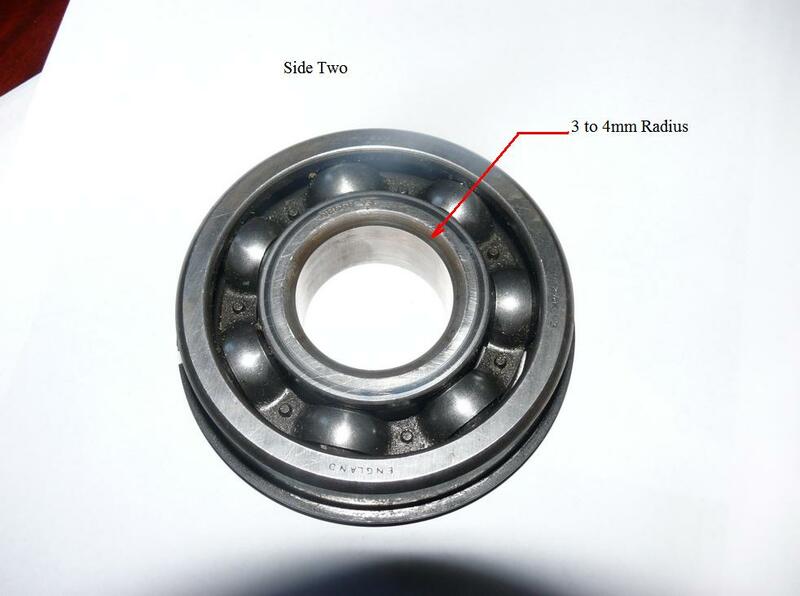 This bearing is no longer available, with the available replacement having a relatively large radius between both faces and bore of the inner race (similar to the larger radius shown in the second picture). The result is that the Oil Pump Drive only makes contact with the face of the bearing via a circular band of approximately 0.020" (0.5mm). Although friction is largely independent of surface area, this small band contact compacts the face of the Oil Pump drive fairly quickly and the clamping force applied by the Companion Flange Nut is diminished. From that point, failure of the clamping force is exponential as the components are able to spin against each other. Wow, thanks for this short lesson. So proper bearing is solution, ok. I have ordered replacement bearing (Martin Robey)...waiting to see what I'll get. You won't get the proper bearing; they are not available. 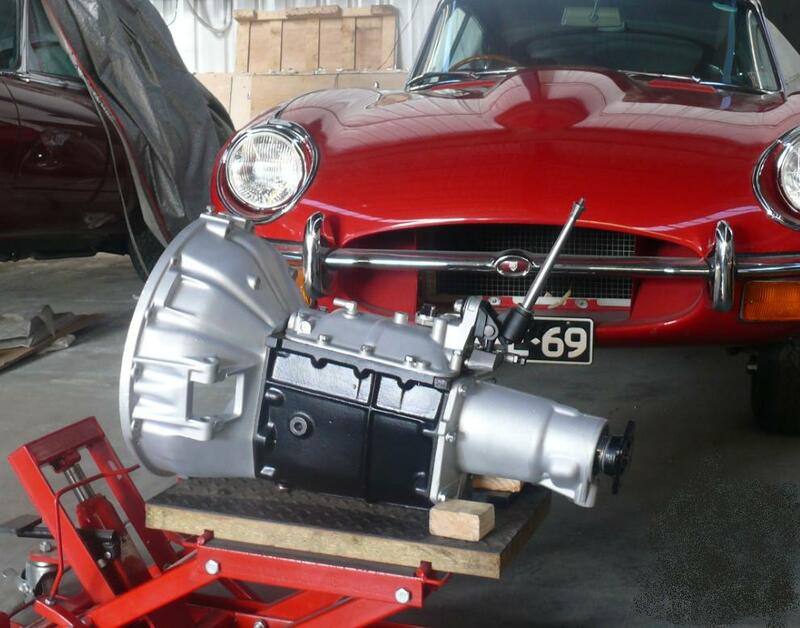 I recondition many early Jag gearboxes and make a modification to the bearing to obtain that important contact between Oil Pump Drive and Rear Bearing inner race face. 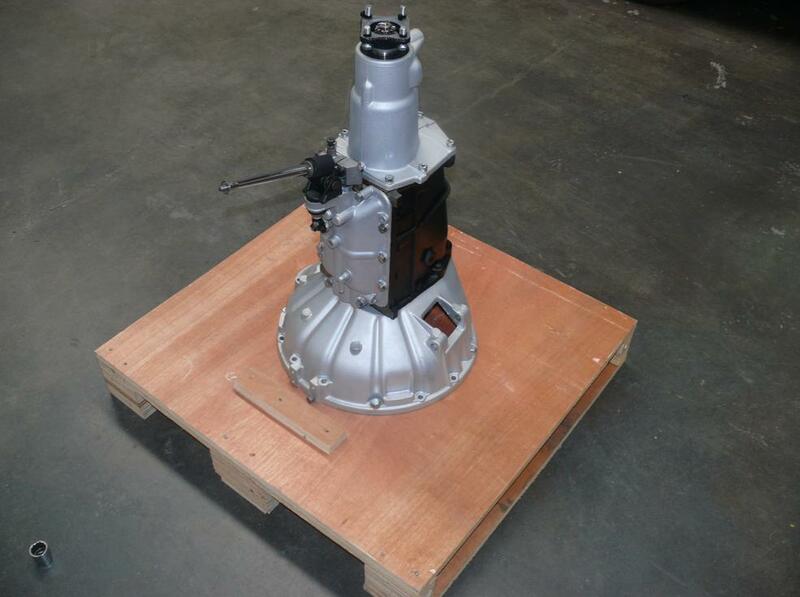 Following are pictures of a finished gearbox being made ready to ship. Find out the origin of the bearing you're getting. If its Chinese, don't waste your time with it. try speaking with Ken Evans at Klassic transmissions. Maybe if Mladen is turning up a new distance tube, he could try profiling the end to match the radius/profile of the bearing? And thus get a greater contact area? Or would that require an unachievable level of precision? The Distance Tube doesn't contact the bearing, the Oil Pump drive does. The Distance Tube sit between the Oil Pump Drive and the Speedo Drive Gear. Only 2+2 wheelbase, manual cars have the Distance Tube. No such component in S1 and S2 TSC and OTS cars, but the issue with the correct bearing being unavailable exists with these cars also. I ordered 3 bearings (all Hoffmann) that I need from MR for 100 GBP (origin not known). I found Hoffmann web page and sent the same request to them and got an offer for all 3 original Hoffmann bearings on 500 GBP, from Orinoco company. Has anybody had any experience with them? Regarding tube, I am making new one, same as it was. 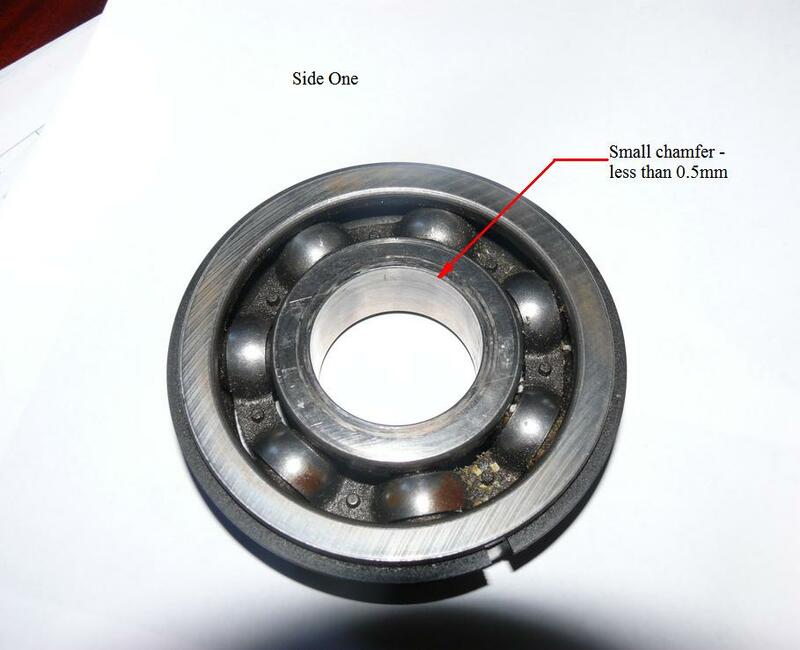 If you can, have the supplier send you a picture of both sides of the bearing so as to determine if the Circlip Side has virtually no radius between the face and bore of the inner race. 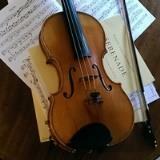 My experience with the Hoffmann company was not good. A few years ago when searching the world for the correct bearing, I discovered the Hoffmann Company and made email contact. After approximately 20 emails, wherein I concisely described the bearing and attached pictured of both sides of an original bearing, as well as supplying the part number of the original bearing, I gave up in frustration. I gleaned that the Hoffman Company of today (they were incorporated into SKF many years ago) don't make any bearings, but just resell bearings. Things may have changed since then, but at the time, the manager couldn't tell me what their bearing that complied with the sizes being sought, looked like until he could get one in and look at it. I would be interested in seeing pictures of the rear bearing you receive and if it has the correct inner race feature at the circlip side of the bearing.